The unique, incomparable works of Carrol Boyes closely resemble something you would stumble across in an art gallery – and similarly, they evoke discussion, emotion, and transformation. Based in South Africa, Carrol Boyes creates pieces that are equal parts artful statues and functional additions to your home. Truly, Carrol has a unique gift for taking a plain, everyday object and transforming it in to a sculptural, collective item. Whenever she designs a bowl, a dish or even a jug, Carrol includes statuesque figures that intertwine and become part of it, celebrating the beauty of the human form as she does so. Her creation is then cast in polished aluminium for a timeless appeal, and finished by hand for individual character. 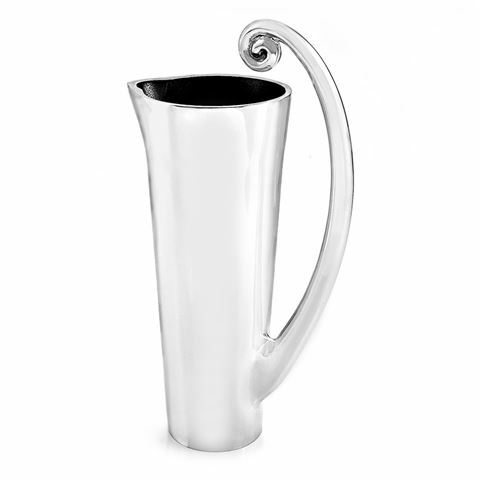 The Coil Water Jug is a fantastical creation and is sure to become a conversation piece, with its inverted handle that curves in to a decorative curl at the top. With Carrol Boyes at the table, you’ll be well on your way to creating your own private art gallery. Designed and made in South Africa. Cast in lead-free aluminium, and then finished by hand. Presented in a Carrol Boyes box.